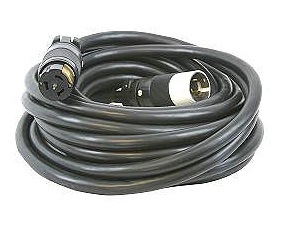 CEP #6400M, 100' Temporary Power Cord, 6/3-8/1 Sow Rubber Cord With CS6365 50-Amp Male Plug & CS6364 50-Amp Female Connection. Price/Cord. (Shipping Lead Time is 1-2 Business days). STOW grade flexible cords are designed for extra tough duty with heavy tools, portable lights, and power extensions. STOW is a modified PVC Jacket. CEP is a manufacturer of Temporary Power Distribution and Portable Lighting, serving the construction/industrial markets. Construction grade rubber cord is ideal for generators, welders, large power items. These cords are designed to supply 50 amp, 240 volt power to temporary power distribution centers with input current of 50 amps, 125/250 volt AC, 3-pole, 4 wire. GFCI Modules will provide protection against ground faults only. They will not protect against overloads or short circuits. There is no known device that will guard against the electrical shock hazard resulting from contact with both the “hot” and neutral wires of the electrical circuit. CEP #6403M Temporary Power Y Adapter, 2 ft., 50A Heavy Duty SOW Rubber Jacket with 6/3-8/1 Gauge Wiring. 125/250V (CS6365) Plug to (2) 30-amp Connectors (L1430 250V). Price/Each.